As experts on Hotel Cleaning, we love to share articles on the hotel industry when we come across them. We came across this article we thought you’d like. The food and beverage industry has been transformed in recent years. I recall the early days, when I was part of the team responsible for renting spaces such as the Criterion in Piccadilly Circus to Marco Pierre White and the, then ground-breaking, Atlantic Bar and Grill in the basement of the Regent Palace Hotel. These were prime, central London locations, expensive real estate but, previously, under-utilised. The sector has continued to evolve and we continue to see new trends, such as street food and small plates. Sharing experiences of food and beverages on social media is now commonplace and as quickly as tastes are changing, consumers’ choices are expanding. The days of the dreaded “three meal a day hotel restaurant” are, thankfully, coming to an end. Many players in the hotel industry have responded to these changes but can, and should, we do more? Throughout my career I’ve been reminded that many hotels contain attractive and, perhaps more importantly, valuable restaurant real estate, which should be designed to attract the same volume of guests as our high street competitors. However, all too often these spaces are empty and soulless. 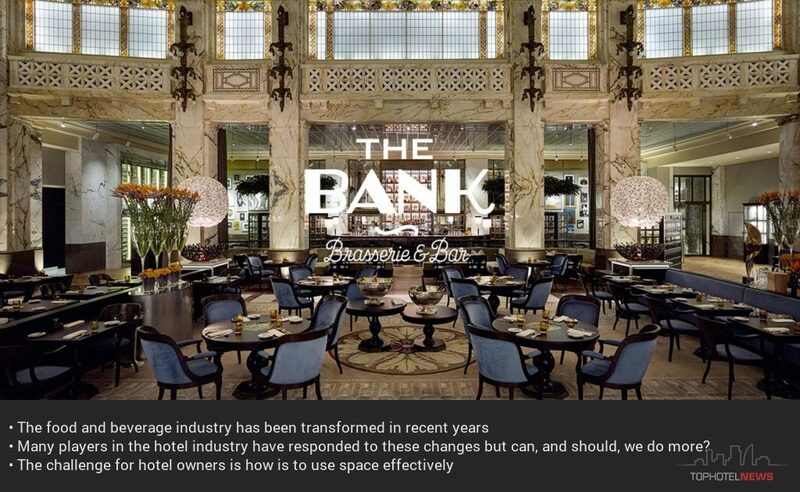 The challenge for hotel owners is how is to use space effectively. The physical location of a restaurant or bar within a hotel – and its accessibility – are crucial factors in determining whether it can stand alone commercially. To attract non-hotel guests, access needs to be as simple as possible and it’s even better if it can be differentiated from the hotel experience. On the other hand, hotel guests will be attracted to a restaurant or bar which feels rooted in the community, where they feel they can mingle with the locals and even become a local for a few hours! In the right place, and when built with thought, restaurants make a big difference to the hotel’s profile and footfall. For example, Hyatt created the Bank Bar and Brasserie at Park Hyatt Vienna. First opened in 2014, this space retained the grand, marbled style of a 100-year old former bank to create a dramatic and attractive venue where guests want to eat and drink. In 2018, the restaurant’s revenue has increased 17.5% on the previous year and really interestingly, 90% of diners are now non-hotel guests. How did we get there? We broke out of the siloed space, away from starchy-linen tablecloths and old-fashioned menus and instead reimagined what the restaurant could be – a fun place to attract the Viennese crowds for meals and drinks. We tapped into the old architecture and history of the building, which used to be a bank, and themed the outlets around this. The bar is now constructed around the former cashier stations, with the coolest mixologists in town creating currency-named cocktails. A show kitchen offers central entertainment and an own entrance provides access directly from the busy street. The result is a destination of its own right creating memorable experiences for guest. Because that’s what they want. Development plans also need to consider how the way people eat is changing – spaces need to welcome groups with sharing platters, business lunches and couples enjoying a pre-dinner cocktail, all at the same time. Hotel restaurants’ popularity has traditionally come from breakfast but many of our more successful F&B outlets now generate 70% of visits between lunch and the end of the night. As a consequence, at Hyatt, we are ever-more focused on working with our partners to ensure that we are not creating restaurants and bars for the sake of filling a space or, even worse, ticking a ‘brand requirement’ box. Furthermore, our brands are becoming increasingly flexible so that the food and beverage operation is relevant to each hotel’s location, positioning and target customer.In some cases, there is no need to provide extensive food and beverage facilities; there are hotels and locations where the mantra is “keep it simple”, to offer the in-house guest what they need and expect, without building a restaurant which will be empty for 20 hours a day. At Hyatt we endeavor to understand hotel food and beverage spaces in conjunction with the back of house, to be designed to ensure we maximize value for guests and owners. A good example is in our Hyatt Regency properties, where the ground floor is designed to include multipurpose social spaces and features with maximum functionality, to create what we describe as “The Connected Experience”. Drinking and dining, meetings and events, fitness, and guestrooms all feed into these spaces. As well as allowing guests to seamlessly work, play and relax as they please, this allows us to manage costs efficiently whilst providing all important guest services. Importantly, food and beverage spaces need to be designed so people want to spend time in them, remember them, and talk about them long afterwards because they were nourished both by the food and the soul of the spaceIf the hotel industry takes the right steps to decide both when to compete with the high street on the food and drink experience and when to strip back the offer based on what their guests require, hotel owners will start to see better returns from their assets.